Cavotec develops and manufactures innovative automation and electrification technologies for ports and maritime sectors. 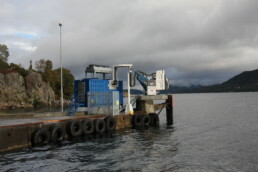 In collaboration with a group of partners, Cavotec has successfully tested a combined wireless induction charging and automated mooring system with a hybrid passenger ferry off the west coast of Norway. Vacuum-based automated mooring technology allows the ship to dock precisely so that the wireless induction chargers can boost the ship’s batteries in port. This in-port electrification has the potential to reduce the greenhouse emissions of the maritime transport sector, which currently accounts for around 2.5% of global emissions. It will also improve local air quality and the respiratory health of local residents and workers. This solution was featured in Sustainable Shipping market of the 2018 Global Opportunity Report, and was selected based on the criteria of that report. Using less fuel in port reduces emissions of nitrogen oxides, sulphur dioxide, and particulates, which all cause health risks and degrade ports’ air quality. CO₂ emissions from the maritime transport sector could be reduced by up to 75% by applying operational measures and implementing existing technologies.